and the first Director of the Boulder Pottery Lab passed away on January 2nd, 2018 at the age of 87. 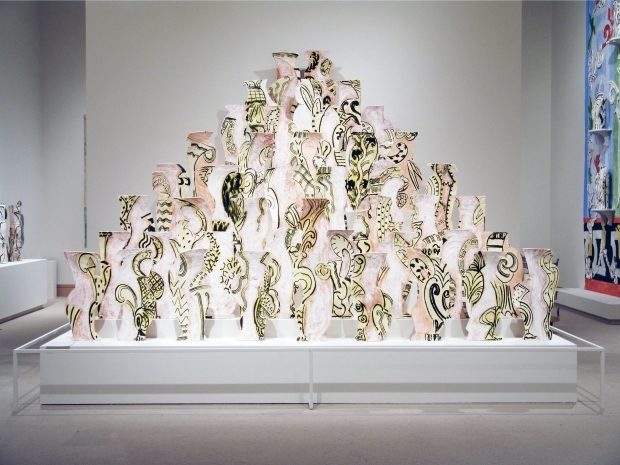 Betty Woodman is known for elevating pottery from functional domestic objects to the world of fine art. She was a celebrated contemporary artist and the first living female artist to have a retrospective at the Metropolitan Museum of Art in New York City - an opportunity she attributes to her pancake recipe! Most important to us was her work in Boulder, Colorado. In the mid-1950s, she convinced the City of Boulder to have its recreational ceramics program in the decommissioned Fire Station #2 on University Hill. The Boulder Pottery Lab was the nation’s first city-run pottery program. "When I started teaching for the City there was one class, one evening a week, of seven people. Fifteen years later there were 400 students taking classes in 8-week sessions. It became a very big program," said Betty in a 1991 documentary (see video below). For years Betty Woodman worked to inspire those at the Lab through her direction and instruction. It was the students of Betty Woodman who went on to found the Boulder Potters’ Guild, creating even more resources in the city for the advancement of the ceramic arts. Woodman also worked at the University of Colorado Boulder and started the Woodman Study Collection, pieces she acquired over thirty years of teaching in Boulder. Betty Woodman left a lasting and powerful impact on the city of Boulder and we wish to honor her tremendous work and dedication to the arts in this community. A tower of 44 individual earthenware vases. Traditional domestic scenes transform into representational fine art. 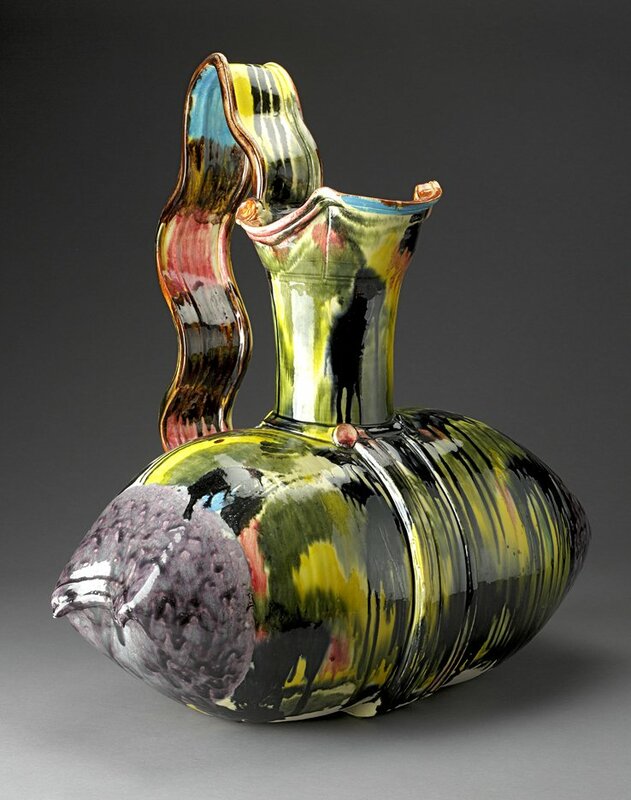 "For decades the city pottery program initiated by Betty Woodman drew some of the most important emerging talent in contemporary ceramics to host workshops in creativity and pottery technology. Faculty members from the University of Colorado and many others responded to Betty's call. It was a clearinghouse to all who wanted information about ceramics and attracted some of the strongest national and local talent in the field. The facility proved so successful that it became a national model for other city parks and recreation programs." "I worked and played in the Pottery Lab from about 1963 to 1975. A turning point in my life was when in 10th grade (1970) I was allowed by Betty Woodman to take "adult" classes. When I graduated from Boulder High in 1973 I was offered the job of Lab Technician. I spent two wonderful years making clay, sweeping, firing kilns, teaching kids classes - being socialized by a wonderful group of women." Combining ceramic forms with paintings was one of Betty's hallmarks. Made from pieces of clay that were leftover after cutting out other forms. In a 2016 interview with The Guardian, Betty said "When I started out, ceramics was not even a material you made art out of. People might have liked what I was doing, responded to it, bought it, eaten off it, but it had nothing to do with being an artist - it was about being a craftsman." Two large cylinders put together to form a pillow, then altered into a pitcher. These pieces were some of her most celebrated works. This porcelain set is now at the Smithsonian American Art Museum. Artist Betty Woodman discusses her first UK institutional solo exhibition 'Theatre of the Domestic'. One of the most important contemporary artists working with ceramics today, the exhibition focuses on work Woodman has created in the last ten years, including a number of major new mixed media pieces. "I worked for Betty as an assistant in 1988 at CU in Boulder. I had no idea at that time that she was so famous. She took me as an assistant, without any degree in ceramics, just because I naively asked her despite the other students telling me I had not a change! Just because she liked me and my work. She was so simple and open, a marvelous person in fact. I loved her a lot and we shared some great french meals together in between two firings. She told me I wanted to reach for the moon. I told her I wanted to reach further, to the sky, and that made her laugh. I just a letter at the beginning of January, thanking her again for all those wonderful moment. To late. Farewell, dear beautiful Betty." Photos courtesy of Salon 94.